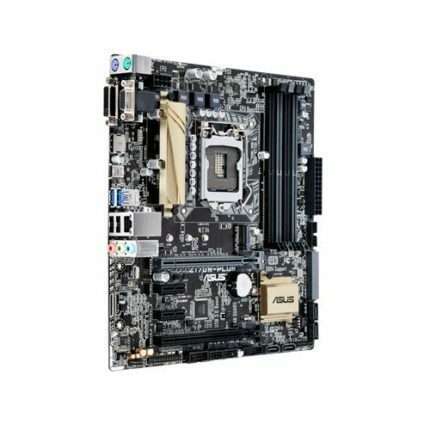 So you’re building a PC and you’ve decided upon an LGA 1151 motherboard, but need help deciding which one. It’s lucky you found us since the motherboard is arguably the most important decision you’ll have to make during the process since it’s basically the heart of your computer and limits the components you can use in your build. But don’t worry! Although it looks complicated, it’s our job to make sure that choosing the best LGA 1151 motherboard is as simple as scanning our list for the situation that best matches your own. With our help, it’ll be simple to pick the best motherboard and get on with the fun part of building your own PC: putting it all together! Below, you’ll find a brief overview of each of our recommendations. These are all widely renowned motherboards, created by respected companies and we’re sure that the perfect one for you is here somewhere. With that out of the way, we’ll now take a closer look at each motherboard and evaluate its features, strengths, weaknesses and ultimately, just how useful it could be to you. 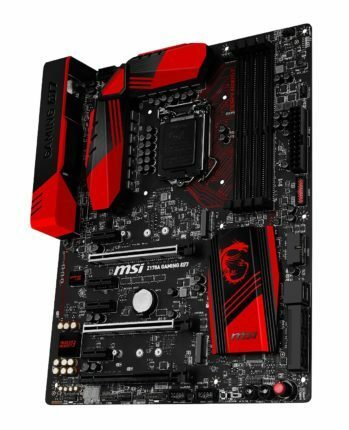 We’ll begin with the MSI Z170A Gaming 7. There are no prizes for guessing who this is aimed at. MSI have long been known for their high-end components and this product is no different. This motherboard has two PCI-E 3.0 4x slots which allow you to use multiple graphics cards to really increase your PC’s gaming credentials. There are two HDMI ports and a DisplayPort on the back, which allows you to display to up to three different monitors at once. This would be great if you’ve really invested in your gaming setup, but for single monitor setups, you won’t need all of these. The really interesting feature of this board is MSI’s automatic overclocking dial. The increases in performance you get from this are not as high as an expert could get, but it only takes a second to turn on and makes sure you don’t fry the board (just make sure you have adequate cooling). Gaming wise, this motherboard is great. Data transfer between the CPU and GPU is very quick and when playing on low resolutions (to minimize the video card bottleneck), you’ll see framerates of over 300 if you have the graphics card to support them (and let’s face it, if you’re buying this, you probably do). Given its high performance, it makes sense that this board is a power guzzler. Whilst it only draws 8W when idle, under load that figure rockets to just below 80W. This is just part of having a high-end motherboard, though, so there’s not much you can do but accept it. There are a good amount of ports, too: 4 USB 3.0 and a further 3 USB 2.0. This will be a godsend for people who use a lot of permanently attached USB peripherals. Even if you don’t think you do, consider your keyboard, mouse, speakers, external hard drive (which takes two ports), WiFi dongle etc. and you’ll realize there’s some truth to the phrase “more is better”. Ultimately, this is a high-end motherboard which gives high-end results. There’s plenty here to like if you’re a gamer, and even if you’re not, you can’t deny that the automatic overclocking and super-fast data transfer is attractive. It also helps that the board itself looks great, but that’s just a bonus. Whilst those on a tight budget or for whom all these bells and whistles are unnecessary might struggle to justify the cost, those out there looking for the best LGA 1151 motherboard for gaming have just found it. Maybe you’re not looking for something huge. Maybe you’re just looking for a small(ish) motherboard for your new build, and you want it to be fast. Well, you’re in luck. The Z170M-PLUS from Asus is exactly what you need. It features a PCIe 3.0 x16 interface, and supports AMD’s Crossfire, meaning you can use multiple GPU’s (assuming they fit and are made by AMD), but unlike the Gaming 7, we have a varied range of outputs: HDMI, DVI, VGA and even RGB. That’s all you’ll ever need to connect to anything, so Asus definitely gain some favor on that count. Despite its smaller size, this board has the same amount of expansion slots and double the maximum RAM capacity of the Gaming 7. Whilst you probably won’t use that much RAM if you’re considering this board, it’s nice to have. On the rear panel, there’s 4 USB ports, two 2.0 and two 3.0. We’d have liked a couple more but it’s not a huge deal and let’s face it, you’re more concerned about the performance than anything else, so let’s get to it. This motherboard performs impressively well on read/write tests, with a bandwidth of around 550Mb per second reading and around 450Mb per second writing. For context, that’s just over 56 MB of data processed every single second. When tested on Crysis 3, which is a very graphically demanding game, our frame rate never dipped below 100 fps when paired with a semi-recent GPU. That’s pretty respectable, but you’ll want to invest in a good CPU to make sure you reach these framerates in the first place. Asus have bragged about how their BIOS screen is fantastic, and we have to agree with that, having seen some frankly hideous ones in the past. It’s mouse controlled and all the options are laid in a logical way and there are no duplicate options hidden away in submenus. We especially liked that Asus have included an EZ Tuning feature that tailors your setup to focus on noise, performance or energy efficiency. We’re pretty impressed with this motherboard. Considering its small size and relatively low price, it’s exceptionally powerful and everything about it is streamlined, from its BIOS menu to its auto tweaking utility. This would be perfect for a PC build on a medium sized budget. Can you imagine having a PC case small enough to hide under your desk, yet powerful enough to play almost anything you want to? This motherboard makes that dream a reality. 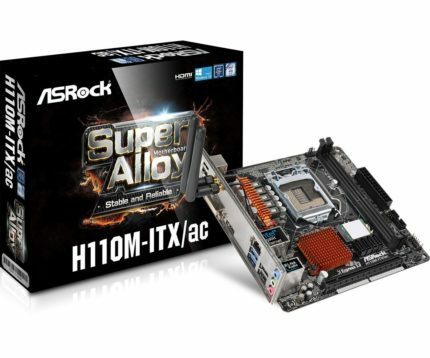 Asrock’s H110M-ITX/ac is a Mini-ITX motherboard. This means that it’s very small but doesn’t necessarily mean that it’s not worth bothering with. In fact, this board has a lot of winning features, some of which aren’t even seen on high-end boards. For example, this board comes with a dual-band WiFi antenna. You have to plug it in yourself but come on, that’s a nice bonus, right out of the box. We found that the cable used to connect the antenna to the board was quite short, but bear in mind it is a Mini-ITX board and that it’s designed for small cases. The BIOS menu is slick and well organized too; it includes a useful screen where you can view various system specs, set specific fan curves and even (gasp) automatically overclock the board. 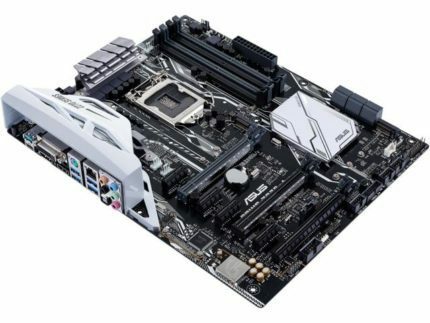 This last feature is relatively common on mid to high-end motherboards, but to see it on a board that costs less than $100 is a welcome surprise. When paired with a decent processor, you’ll see an impressive performance. Data read and write speeds are around 44Mb per second and we noticed no stutter or lag when gaming at low resolutions. Whilst it lacks the capacity to transport as much data as a high-end board, it’s more than worth the price. There are six rear USB ports (2 USB 3.0) and your output options are HDMI and DVI-D. This model has a single PCIe x16 slot, and given the board’s small frame, you’re limited to one small graphics card. This isn’t a massive deal since WiFi is already included and nobody’s going to make this part of their main gaming machine. There are also four SATA3 ports, which should be enough for just about anyone. There is one disadvantage of this board, but it won’t affect everyone. If you want to install Windows 7, you’ll have to use Asrock’s special utility to create a disk image, otherwise, the USB ports won’t work. This is a strange issue that we haven’t seen before, and should really have been taken into consideration when designing the board. Most people will have moved onto a later OS though, especially given that Microsoft offered a free upgrade to Windows 10 a while back. Overall, this board is deceptively powerful given its size and low price point. It’d be perfect on a work PC, thanks to its fast data transfer speeds and a good range of storage and output ports. This is the best Mini-ITX card around, and you can take that to the bank. If you’re trying to build a PC on the smallest budget possible, it’s very important that you can as much bang for your buck as you can. You shouldn’t compromise quality for a lower cost, and the MSI H110I Pro is proof that you don’t have to. Like the H110M-ITX/ac, this product comes with onboard WiFi. Even a low-end wireless dongle will cost you around $10, so the inclusion of this on such an inexpensive board is very welcome. Another interesting feature is the board’s diagnostic LED’s. This help pinpoints specific issues that the board is having, which will be a massive help to new builders, especially if you have the fear that once you’ve connected everything and push the power, nothing will happen. As long as the board is connected, you’ll know what’s wrong. The BIOS menu is fairly sparse, there’s not much to see, but it does a decent job of showing you relevant stats like various hardware temperatures and speeds. There is an overclocking menu, but the motherboard itself can’t be overclocked, rather, this is for adjusting the power given to any overclockable components, so may be of limited use to you, depending on the rest of your setup. The rear of the case sports six USB ports, two of which are USB 3.0. Your outputs are HDMI and DVI, which means that with the right adaptor, you can display to just about anything, so that’s not a concern. There is a single PCIe x16 slot, and an M.2 slot, although it only supports PCIe-based SSDs, so bear this in mind before you purchase one with a SATA connector. Performance wise, this board does a remarkable job. It scores highly in all tests, whether we’re simulating office work, creative work or everyday use. It has a data reading speed of around 450Mb per second, which is comparable to boards that cost a lot more. Whilst it has an average idling temperature that’s a couple of degrees higher than similar models when under stress it’s up to 5oC cooler than others we’ve seen, which is definitely a plus. Overall, we’re very impressed with this motherboard. For the amount it costs, you’d expect something with a much lower build quality, but we are pleasantly surprised to tell you that it has far exceeded our expectations. On a tight budget or trying to make the most of a small case? 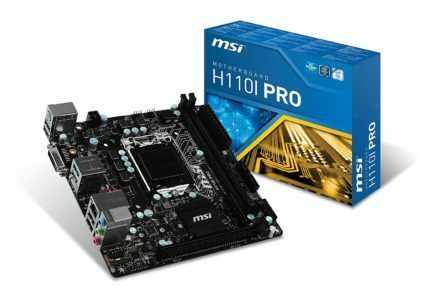 The MSI H110I Pro is everything you need. Okay, so you have a big case and you’re looking for something to fill it. 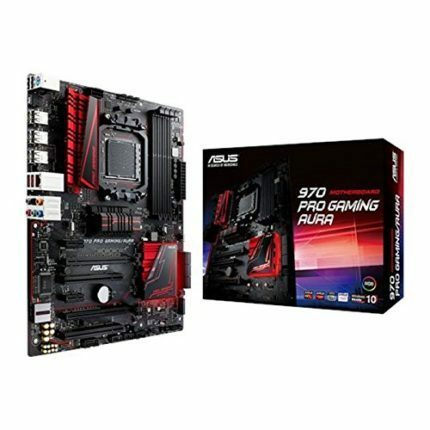 This is a big motherboard, and Asus have tried their best to make use of all the added space by cramming it full of useful things, some of which are often in short supply. Take USB ports, for example. The others in this list usually have six or so on the back panel, but this one has TEN. Only two are USB 3.0, but still, TEN, with another three on the front. How many hard drives do you have? This board has six SATA connectors and an M.2 port. If you wanted, you could have seven permanently attached hard drives. There are five four-pin fan headers scattered across the board, in case you want an advanced cooling system, and if liquid cooling is your thing, there’s plenty of room at the top of the case for a reservoir. The BIOS menu provides a multitude of options regarding multipliers and fan speeds and was pretty simple to use. Advanced options weren’t hidden away in a maze of submenus either, which is useful if you find yourself tinkering with the setup often. This motherboard has two PCIe x16 slots, two 1x slots and two PCI slots. This ensures you’ll have enough space for just about anything you’d ever need to plug in, and with the performance of this model, we’d recommend two GPUs to turn this thing into a monster gaming PC. On recent games like Fallout 4 (on Ultra settings), when using a mid-range GPU, we got steady framerates above 30fps, and with a decent processor, this could easily go much higher. We also found that this motherboard has a much lower energy draw (up to 13% lower) than comparable boards, so it’s not only very powerful but actually costs less to run. Given the name, it makes sense that the board lights up. And boy, does it. The south bridge lights up, as does the SupremeFX chip, and the color is programmable from within the BIOS menu. You can also turn it off if you want, but honestly, it looks great. Overall, this board is amazing. It costs a little more, sure, but the increases in both performance and usability due to the massive amount of various ports and slots make it more than worth the money. As well as looking great, it’s solid, sturdy and packed with enough features to make sure that when you buy this, it’s the last motherboard you’ll need for a long, long time. Since it’s such an important component, it pays to familiarize yourself with some of the important features of the motherboard. This will allow you to more accurately compare different models and find the one that suits your needs. There are a few different sizes (or form factors) that a motherboard can have. The size you need is highly dependent on the size of your PC case. Most motherboards you’ll find today will be Mini-ITX, MicroATX or ATX. These are the smallest to largest standard commercial sizes. It’s important to know that the performance is the same regardless of size, and the only difference is a number of expansion slots for various things like additional graphics cards, wireless cards, etc. You probably know that your computer’s RAM plugs into the motherboard, but did you know that you could add more? Your motherboard will have a maximum amount of RAM that it can handle, and a specific number of slots to put extra into. Make sure you don’t buy more than you can use! The chipset is the collective name for a group of chips on the motherboard that are responsible for data management and communication between various hardware components. Nowadays, they’re generally separated into two parts: the north bridge and the south bridge. The north bridge is connected to your processor and is responsible for transporting data between the CPU, memory, your video car, and the south bridge. The south bridge is used to transport data to external peripherals like hard drives or USB devices. It’s not connected directly to the CPU, so it’s slower than the northbridge, but multitasks better. In practice, you’re looking for a chipset that has a high rate of data transfer. If it has 8x PCI Express compatibility, that’s a bonus, but don’t worry about it too much. As long as your processor fits, and the motherboard fits into the case, you’ll probably be fine. So there it is. We’ve put a lot of time and effort in to weight the strengths and weaknesses of each of our recommendations. Each and every motherboard on this list is fantastic in its own way, but after much consideration, we’ve decided that the ASUS 970 Pro Gaming/Aura is our favorite motherboard. It packs a punch more than deserving of the price, and its plentiful features help ensure that if you have the space for it, you can do anything you want. We hope there’s at least one product above that’s caught your eye, one that’s suited to your situation and future requirements. Our research was, as ever, comprehensive and intensive, so you can rest assured that the products we’ve suggested are definitely the best LGA 1151 motherboards on the market. Thanks for taking the time to read this, and we hope to see you again the next time you need advice.